You may think that a bridge is just a structure that goes from here to there by the shortest available route. Bridges are perhaps little more than short cuts across rivers, roads, railways and estuaries, yet somehow they are more than just the sum of their parts. They are functional objects, yet we have learned to appreciate them on an aesthetic level. We know their importance so we celebrate them in art and literature....... 'A Bridge too Far', 'The Bridges of Madison County', 'The Bridge Over the River Kwai', the list goes on and on. 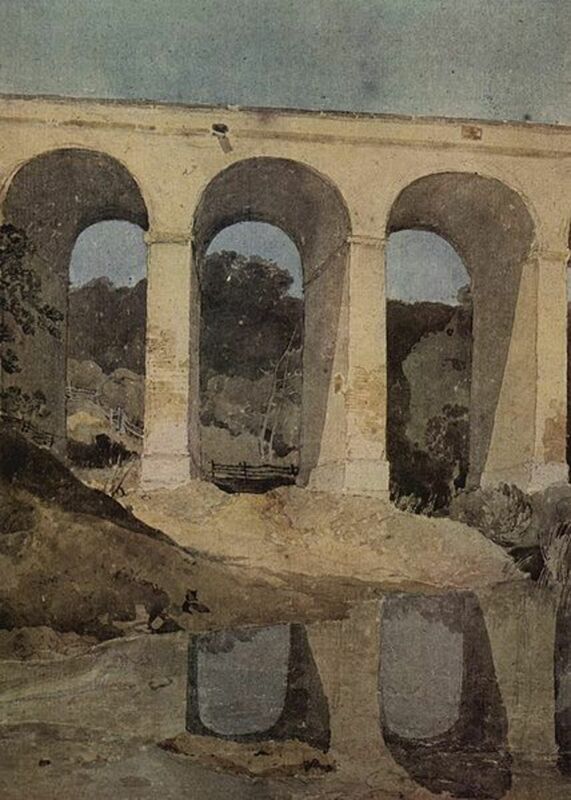 This is an article about the bridges and aqueducts that have been celebrated and immortalised by artists through the centuries. 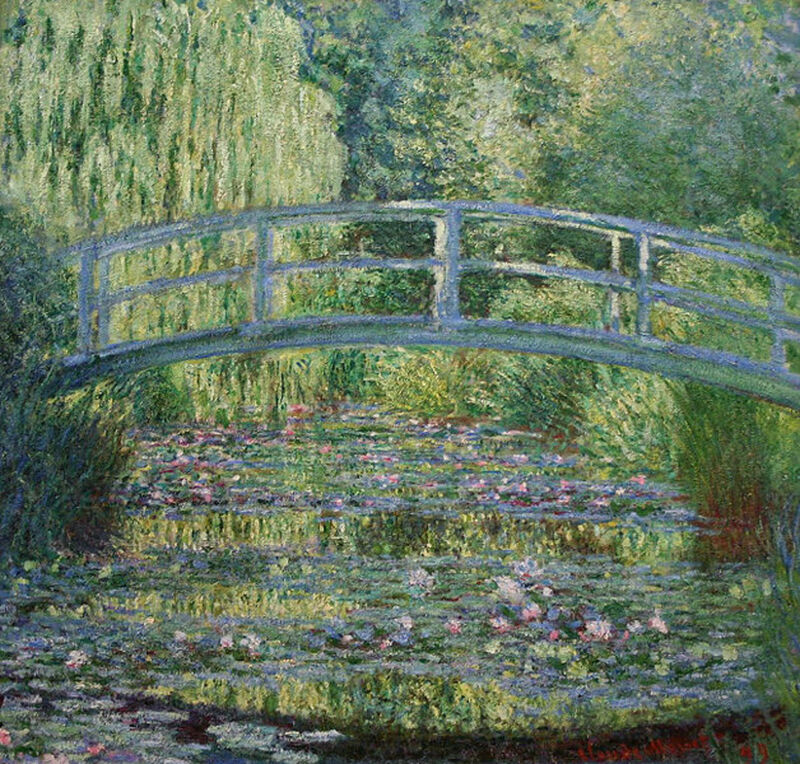 Some, like Monet's bridge over the lily pond at Giverny, are decorative and contrived, whilst others, like Edward Willis Redfield's 'Brooklyn Bridge at Night' are more imposing and functional. Whilst other structures are torn down, replaced, and modernised, bridges tend to endure. I like to think of bridges in a metaphorical sense. We 'burn our bridges', or we 'mend bridges' or we 'bridge the gap', or we 'build a bridge'. Bridges are about joining together. They exist as a geographical convenience, but also as a link between dreams and reality. 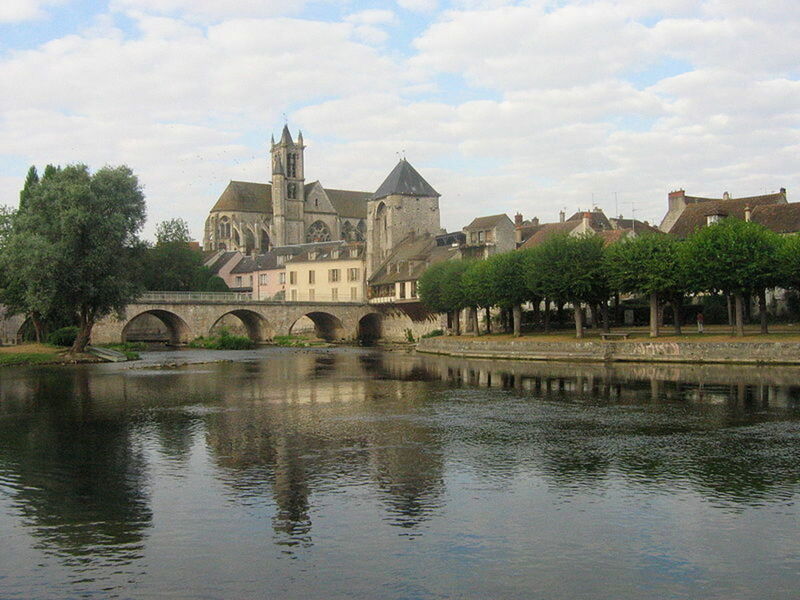 This would have been a fairly new structure when Monet painted it in 1874. The railway itself was still a recent innovation back then, and what a change it must have wrought on the late Victorian era. Suddenly even those too humble to own horse-drawn transport, could travel long distances in comfort and style. Claude Oscar Monet was born in Paris in November 1840, and died in Giverny, France in 1926. During his long life, he will have seen great changes to the world around him. The advent of the railway and the motor car both put an indelible mark on the landscape. Later in his life he will have seen the earliest airships and aeroplanes, and experienced the horrors of the first World War. This tranquil painting of the railway bridge has a strangely modern feel about it, perhaps because this bridge, and others very like it, are still part of the landscape today. Alfred Sisley painted several views along this stretch of river, and as you can see from this photograph, it's still an attractive place to paint and take photos. 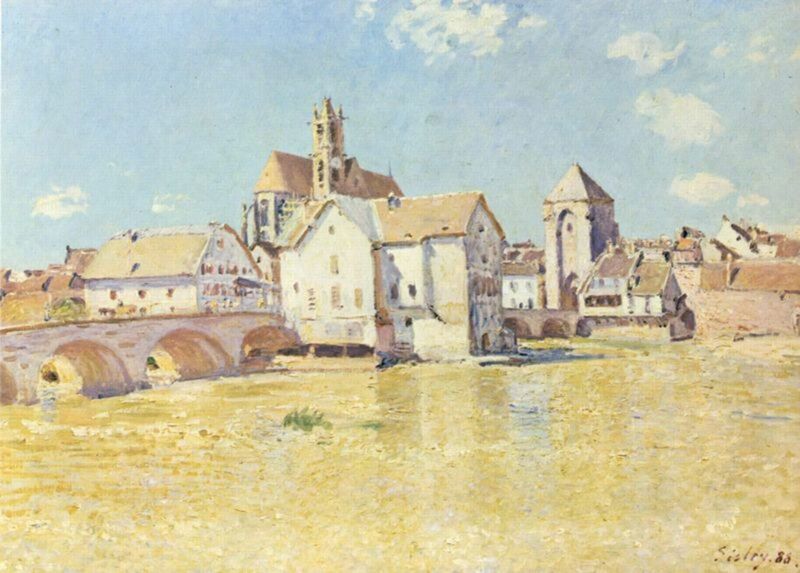 Some of the buildings in Sisley's painting have either been altered or replaced since 1888, but the old bridge remains unchanged. Vincent Van Gogh painted several of the bridges in this region in the 1880s, but many of the original structures have been replaced over time. In 1962 this replica of the bridge of Langlois was built 2km south of the site of the original, as this photograph by Guido so beautifully shows, though sadly, the vivid yellow paintwork is not in evidence. 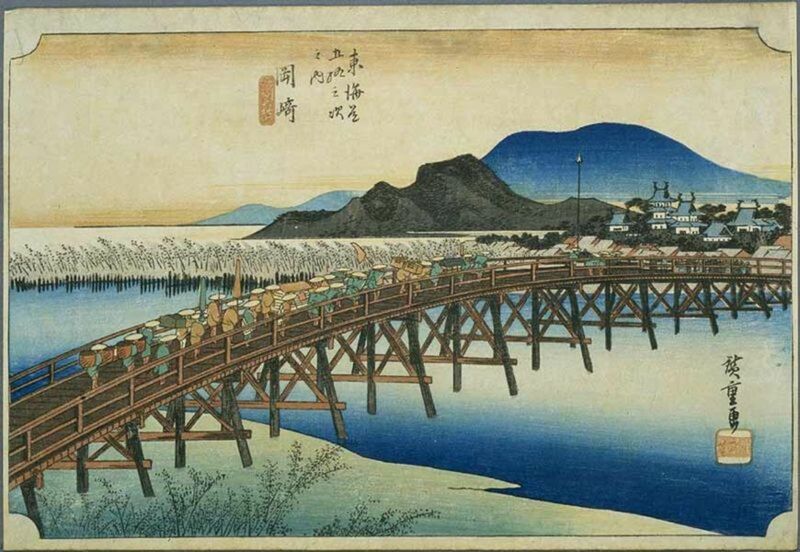 Utagawa Hiroshige (sometimes known as Ando Hiroshige) was born in 1797 and died in 1858. He was a Japanese artist specialising in the Japanese ukiyo-e tradition of painting. From 1833 to 1834, Hiroshige undertook a 300 mile journey along the Tokaido route, visiting the 53 Stations where weary travellers were able to obtain food and lodging on their travels.Shukuba, as these stations were known, were post stations established during the Edo Period in Japan, and were mainly located on one of the Edo Five Routes or one of its sub-routes. Hiroshige went on to publish the illustrations he made along the road, giving dates and locations, and recounting anecdotes told to him by fellow travellers. 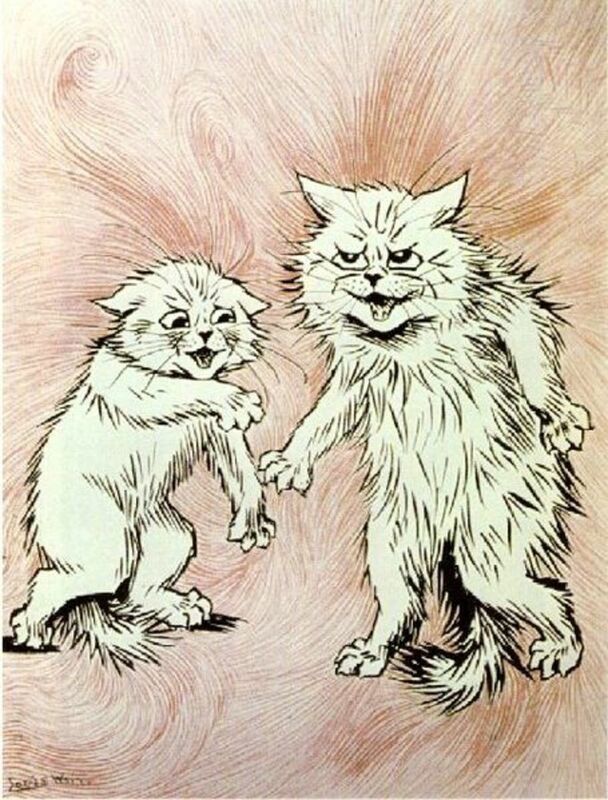 The series was very popular and went into several re-prints. 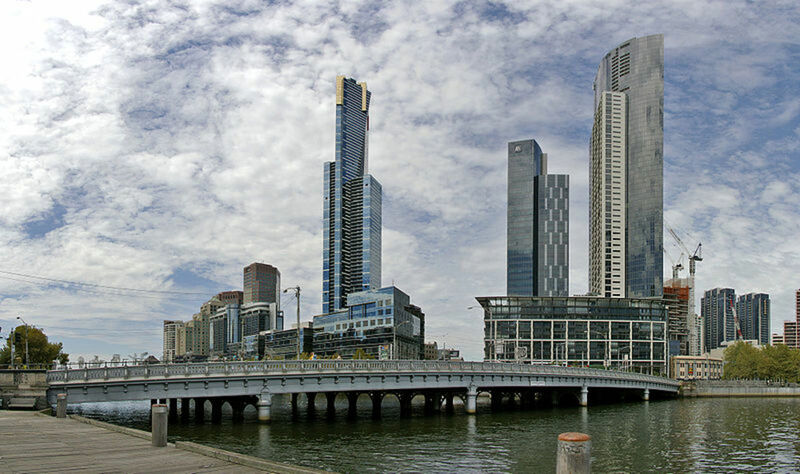 Queens Bridge, Melbourne, photographed by Bidgee. Image courtesy of Wiki Commons. The Falls Bridge painted by McGubbin in the 1882 was subsequently rebuilt and renamed. Queens Bridge photographed above by Bidgee, stands on the same stretch of the river, and was built in 1889. There's quite a contrast between old Melbourne, and the modern city. Abramtsevo is an estate located north of Moscow in the proximity of Khotkovo, that became a centre for the Slavophile art movement in the 19th century. 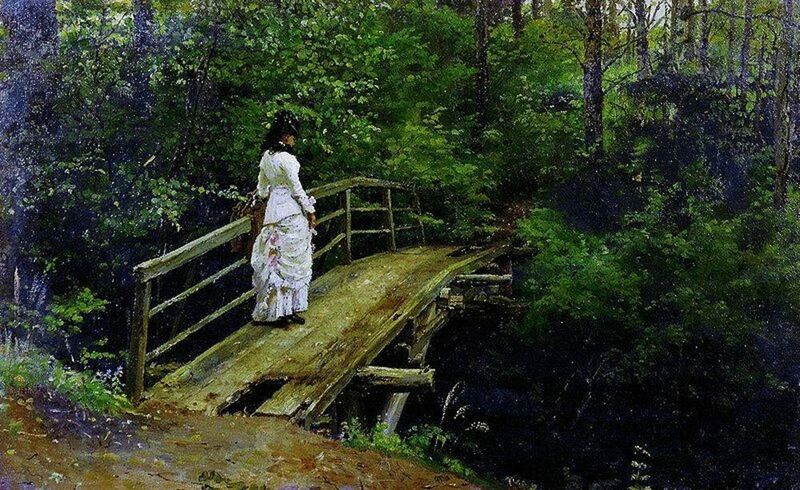 It was here that the artist, Ilya Repin (1844-1930) created some of his loveliest and most evocative works, including this glorious study of a lady crossing a ricketty bridge in a woodland setting. 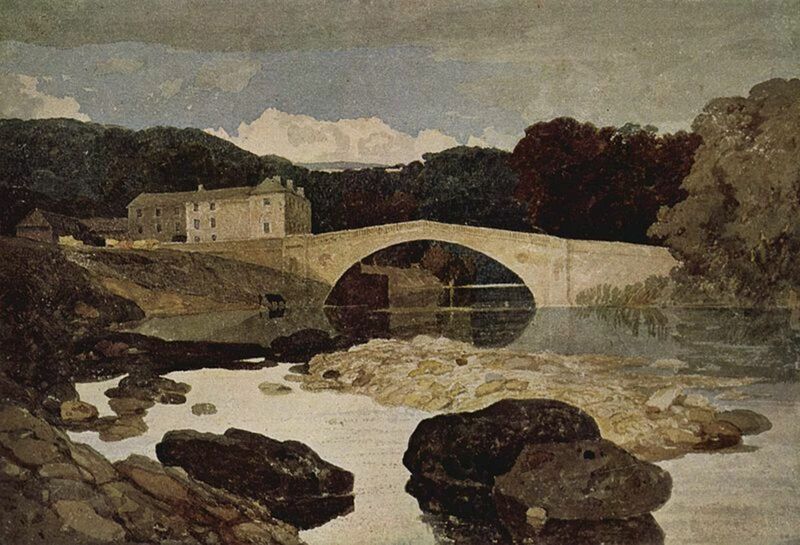 John Sell Cotman (16 May 1782 – 24 July 1842) was an artist of the Norwich school and an associate of John Crome. He was born in Norwich, England and worked primarily in watercolour but also produced architectural etchings and drawings. His carefully observed and meticulous paintings have a very serene feel to them, like this example, painted in Co. Durham (then part of North Yorkshire) in1805. 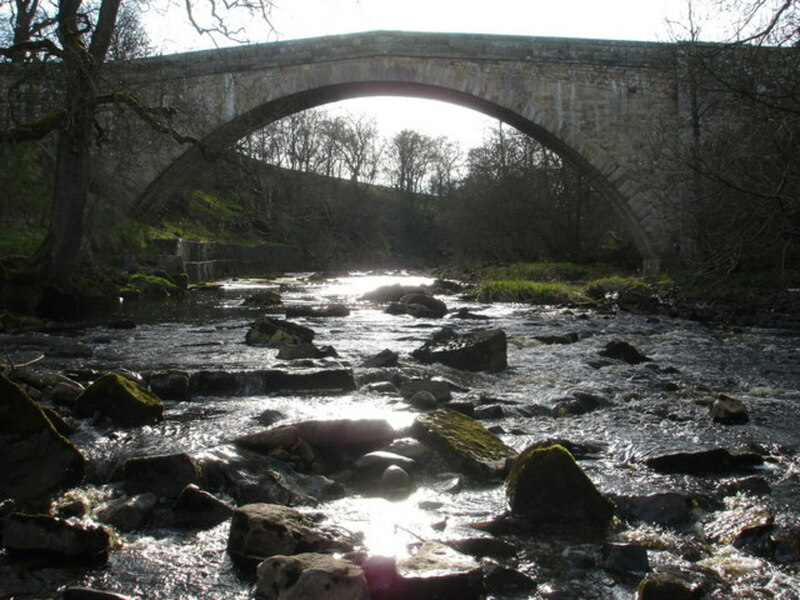 The bridge itself is known as Rutherford Bridge, and was built in 1773. 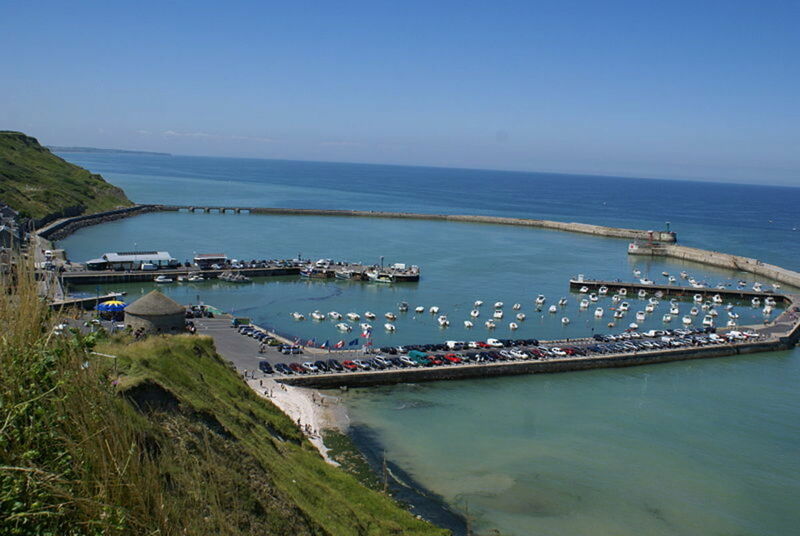 It was named after a medieval village which has since been lost. The distinctive shape of this 18th century bridge instantly identifies it as the same bridge painted by John Sell Cotman two centuries ago. The old stones probably have many a tale to tell. Frederick Oakes Sylvester(1869-1915) was an American artist. His rendering of this St Louis bridge at night is very atmospheric and Impressionistic. The bridge is still as attractive today, as this contemporary photograph ably illustrates. 120 years have passed between the creation of the two images shown above, but many of the features shown in Seurat's picture can still clearly be identified in JrPol's more contemporary photograph. 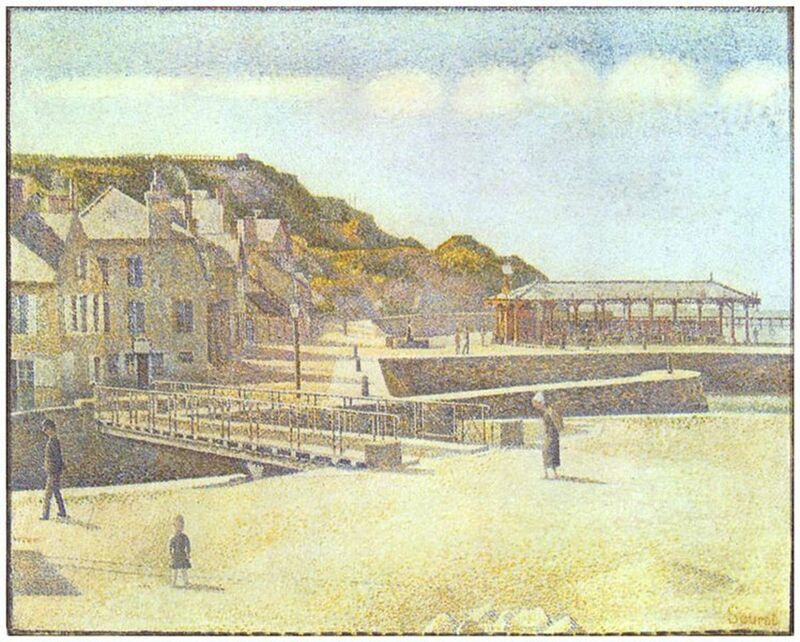 Georges Seurat (1859-91) painted a number of scenes in and around Port-en-Bessin. Claude Monet arrived at his new home, Clos Normand in Giverny, France in 1883, and he lived there until his death in 1926. 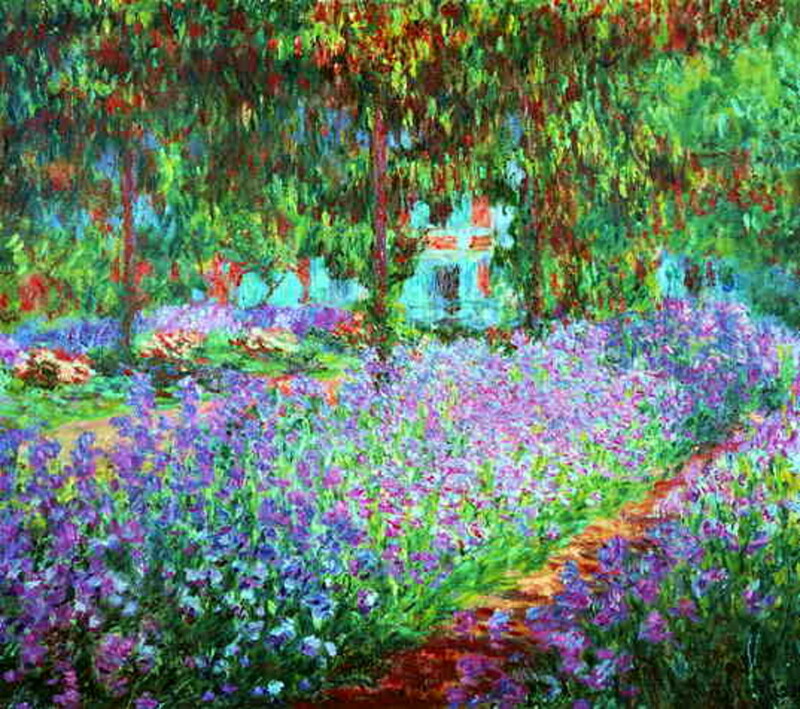 During his time at Giverny, he landscaped the gardens to provide him with wonderful scenes to paint and enjoy. Not least of these was his famous lily pond and Japanese bridge. 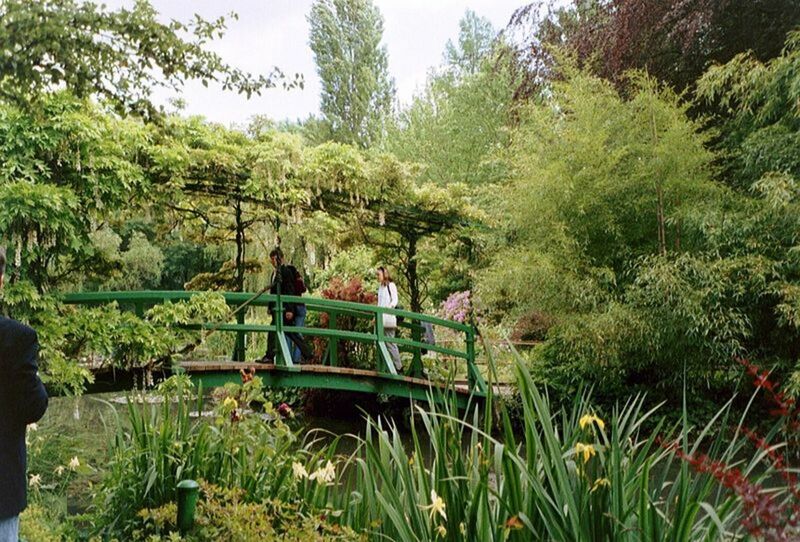 The house was eventually inherited by Monet's son Michel, who, on his own death in 1966, bequeathed the house and gardens to L'Academie des Beaux Artes. 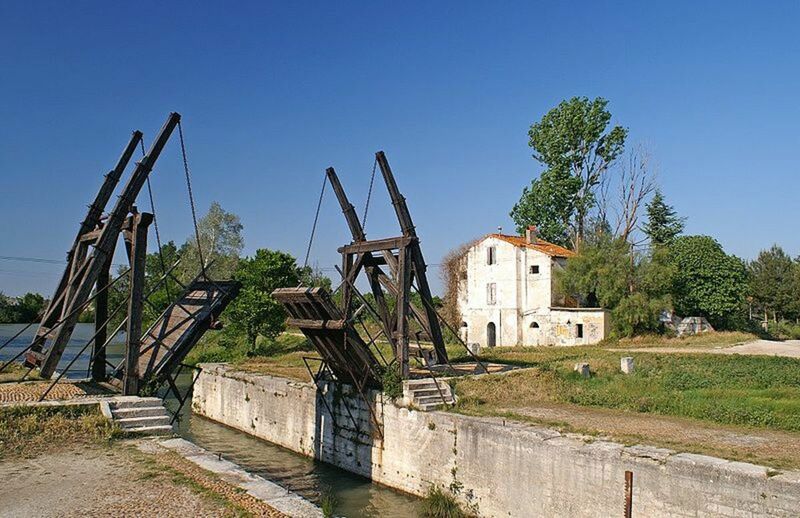 After a long period of restoration during which the famous bridge had to be completely re-built, the property was eventually opened to the public, and can now be enjoyed by everyone. 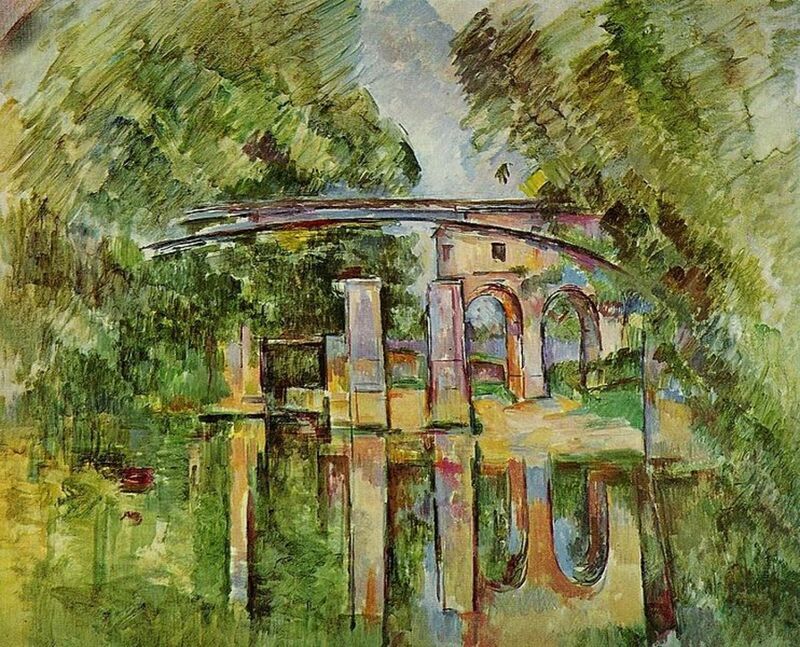 Paul Cezanne, Aqueduct and Lock. Paul Cézanne (19 January 1839 – 22 October 1906) was a French artist, born in Aix-en-Provence, France. His highly characteristicl post-Impressionist style of painting forms a bridge between the Impressionism of Renoir and Monet, and the later Cubist innovations of Picasso and Matisse. 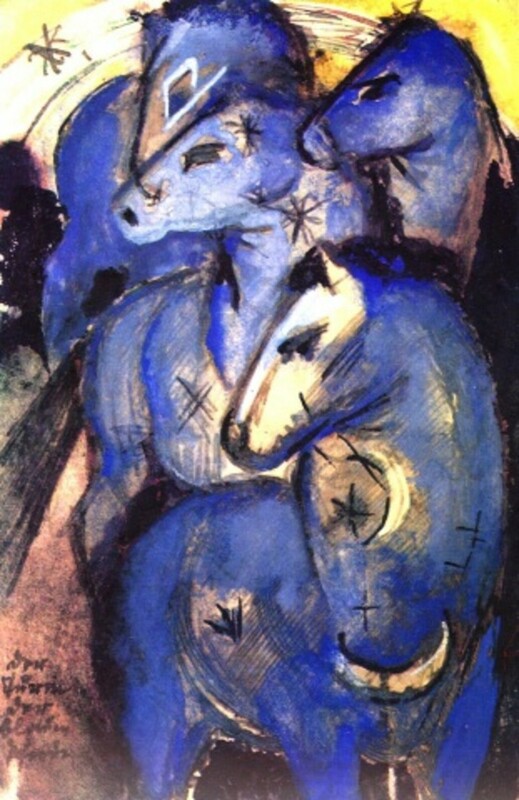 Cézanne's often repetitive, clearly defined brushstrokes were used to build up planes of colour indicating form and mass, that would then, often be given distinctive linear outlines. It was a new way of painting and of expressing the landscape, and Cezanne's work influenced the development of many of the great 20th century artists. 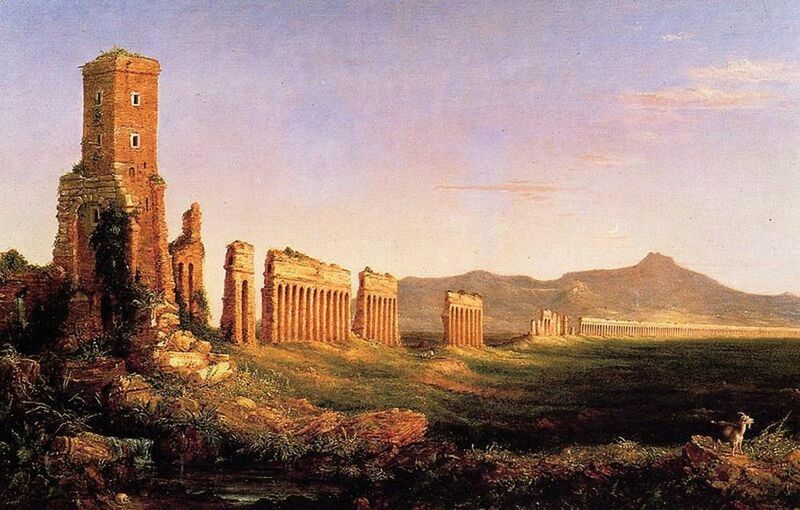 Thomas Cole (February 1, 1801 – February 11, 1848) was an English-born American artist who helped to found the Hudson River art movement of the mid-19th century. Cole's paintings are mainly landscapes executed in a Romantic and naturalistic style, and many of his works were completed during lengthy trips to Europe. 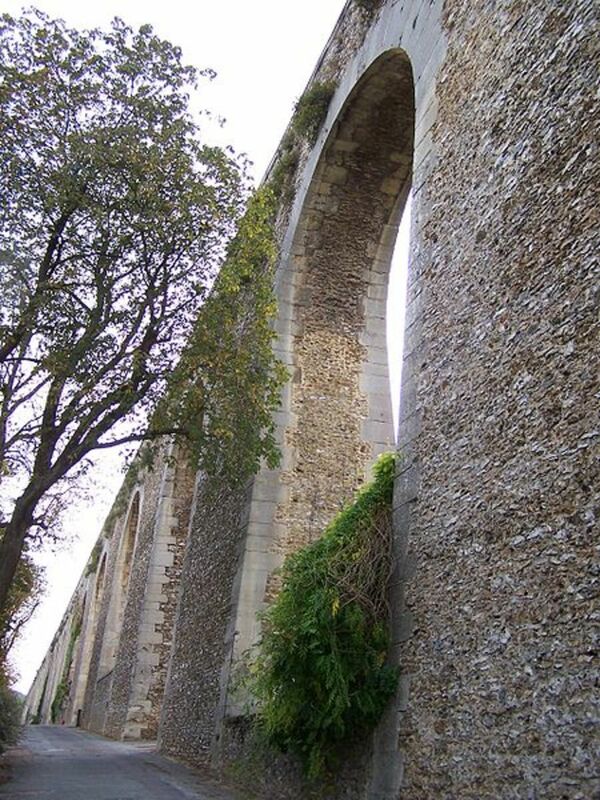 This Roman aqueduct is a typical example. Cotman's fine watercolour drawing of Chirk Aqueduct in 1804 was made before the railroads carved their routes across the British countryside. 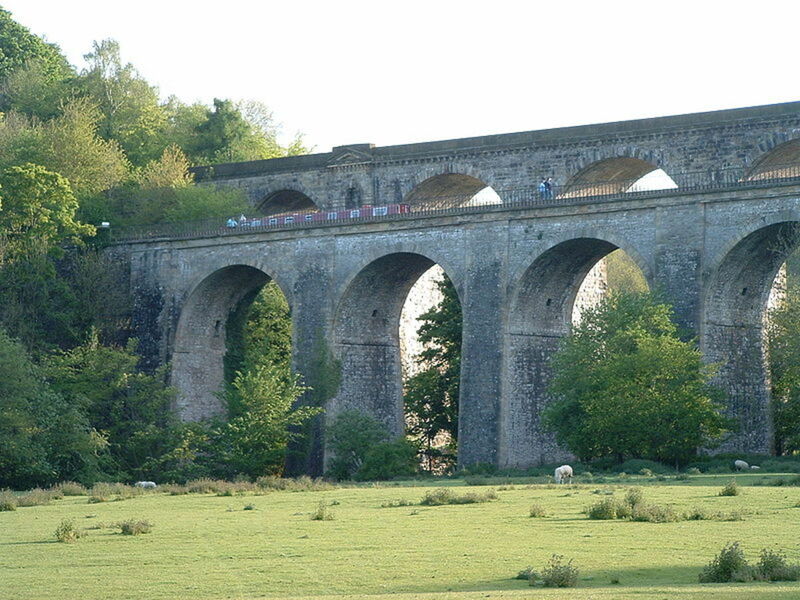 The Aqueduct enabled the Llangollen canal to cross the valley at a convenient point in this hilly terrain near the Welsh-English border, and the railway sensibly followed suit some years later, as the 2005 photograph clearly shows. 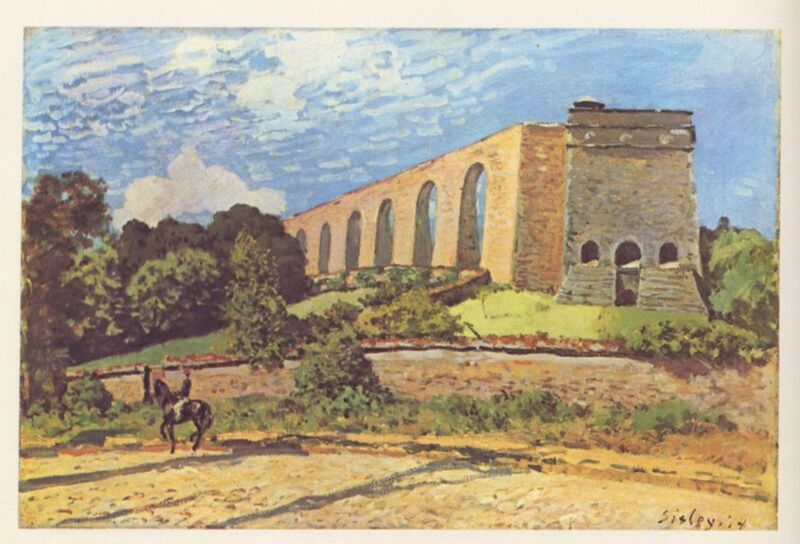 The Marly Aqueduct by Alfred Sisley, 1874. This painting is in the Toledo Museum of Art. Image courtesy of WikiCommons. Alfred Sisley (1839-1899) was born in Paris to British parents, and, despite applying to become a French citizen, he remained British until his relatively early death aged 59. An early associate of the Impressionist artists, Frederic Bazille, Claude Monet and Pierre-Auguste Renoir, Sisley became famous for his wonderful landscape paintings which he preferred to paint 'en plein air' as far as possible. This painting of the Marly Aqueduct is typical of his choice of subject matter, and the suggestion of bright sunlight baking the huge edifice is strengthened by his use of orange and red on the walls. I particularly like the small figure of a horseman in the foreground. I think it gives even more emphasis to the grand scale on which the aqueduct was built. Louis XlV's grand palace of Versailles is famous for it's fountains, as was once the smaller palace at Marly. The huge quantities of water required to maintain these fountains needed to be brought to the palaces via aqueduct, and the Marly aqueduct, whose ruins still stand today, was completed in 1684. The Marly aqueduct was, however, only a component of the overall system. The famous Marly machine was designed and built at a nearby location to take the waters of the Seine 163m higher, and a series of 14 huge water wheels, together with 221 pumps were put into action. It was a marvel in it's day, and although the high cost of up-keep and maintenance of the machine proved too difficult to justify in the long-term, elements of the system remained in use until 1817. 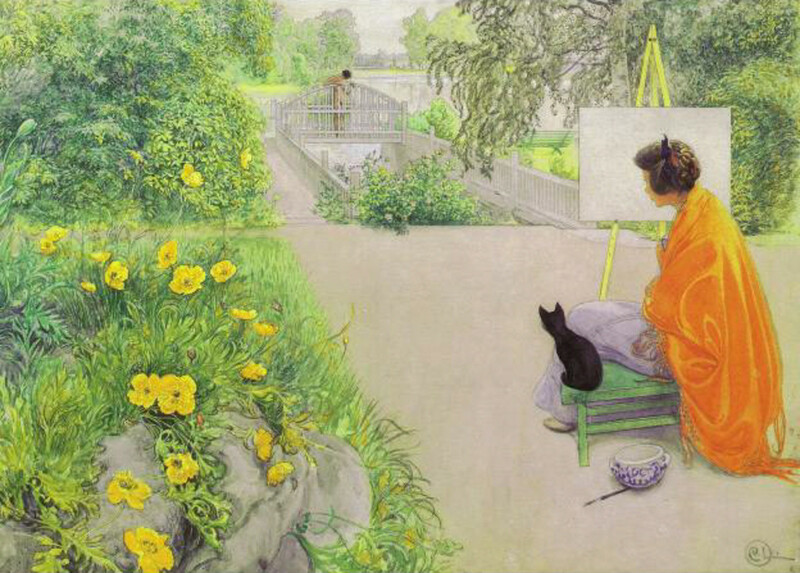 'The Bridge at the Harbour' by Carl Larsson, 1912. 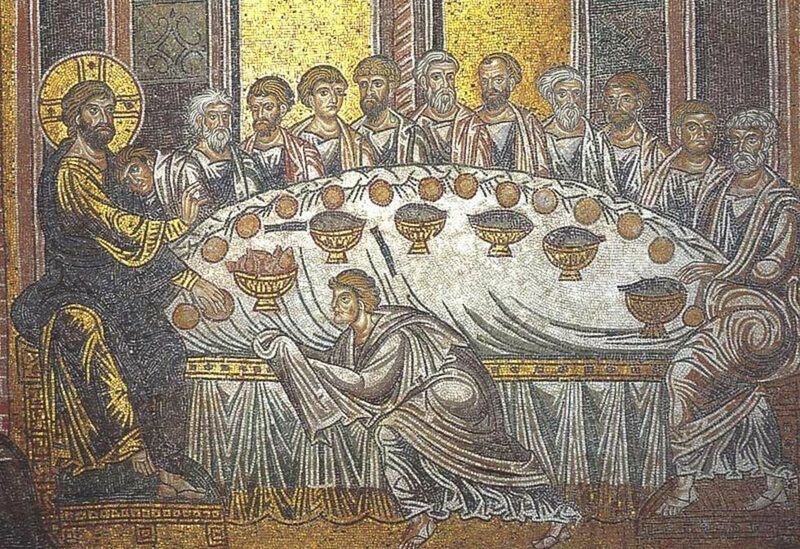 Courtesy of Wiki Commons. Hi Triciajean. Thanks for stopping by and commenting, and I look forward to reading your hub. Thanks for the many fine pictures of art and actual bridges. You are right. We like them for more than practical reasons. I'll try to find you a picture of the Bailey Island Bridge in Maine. The construction is supposed to be quite unique at least for the Western Hemisphere, possibly more common in Norther Europe. Since I can't upload the picture here, I'll do a hub on it. Watch for it. Hi Money Glitch, there's something special about bridges. I often thing you can pick up echoes of the people who've crossed them ahead of you, and I find myself wondering about urgent errands and lovers trysts. Probably just my over-active imagination! LOL! Hi Peg, thank you for stopping by and commenting. I agree that bridges often are works of art in their own right, and I find that the more I contemplate them, the more I enjoy them. Some of the bridges pictured hold a particular appeal for me, and Brooklyn Bridge is one I'd particularly like to see in real life. Loved this hub, so beautifully detailed and the pictures were fantastic. Bridges are fascinating structures and each is a work of art in itself. We used to live in the Florida Keys and our travels to and from there took us across many bridges including the Seven Mile Bridge and the Brooklyn Bridge. Hi Barb, Your father was a sensible guy. It's definitely better to build bridges than to burn them! The great thing about bridges, both practically and metaphorically is that they make communication easier. From an engineering point of view, they are undoubtedly a challenge, but a very worthwhile one. Bridges are integral to progress and prosperity, but there is also a romance and a mystique about them that gradually builds over time through need and use. As an object, I'm not particularly excited by them either, but when you consider them in other contexts they become more interesting, and I guess that's what this hub is all about. It is quite amazing, all these artistic renderings of bridges! I had no idea. I don't find them very interesting as a separate item but together they generate a fascinating hub. My father wanted to build bridges. I suppose from an engineering point of view they were challenging exercises. 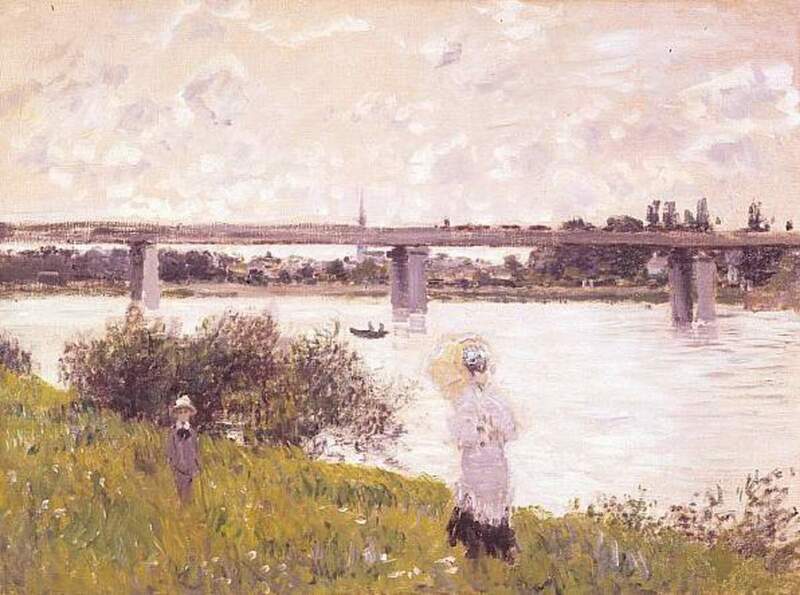 Personally, I like Monet's version of the bridge as part of the scene versus the entire focus. But I did love the movie Bridge over the River Kwai, lol. You have me thinking now... I always appreciate your hubs for that aspect as well as all the lovely art pieces you dredge up for our viewing pleasure! Thanks. Hi Hummingbird and Earnest, glad you both enjoyed the pictures. This is definitely one of my favourites of my own hubs, and it was a lot of fun putting it together. So beautiful! I loved this hub Amanda, your choices of art and photos are superb! This is a good hub and I like your choice of photos. They are excellent. Plus Art Garfunkel was the perfect ending. Hi Jayjay, I really got into the research aspect of this hub. I love seeing how artists interpret the world around them, and the photographic version makes for an interesting comparison. Love this hub, what a great idea the 'Then and Now' pictures are. Hola Elena, It's surprising really, but I could have doubled the length of this hub, and still had bridges to spare! They're a popular subject, perhaps because they're so enduring a feature of the landscape. The Frederick Oakes Sylvester painting is certainly atmospheric. I've always had a soft spot for sunsets and sunrises! Such an original content you've got here! I never thought there were so many bridges in art, actually never thought of bridges as any sort of feature in art! 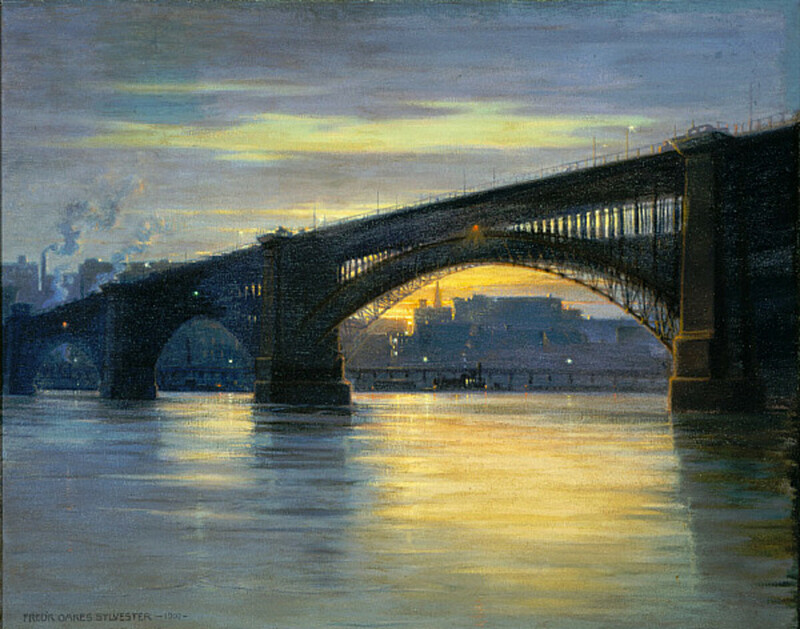 :-) There are some incredible paintings here, this bridge by Frederick Oakes Sylvester is pretty outsatnding in my eyes. Kudos! Hi Sheila, I'm glad you enjoyed the pictures. Thank you for stopping by and commenting. Every one of your pictures was just beautiful. I really enjoyed the trip. Thank you. Hi Mike! It's been a while since we last met here, and it's good to see you as always. THe Oakes Sylvester bridge is totally gorgeous. Just looking at it conjures up images of the Mississippi river boats, and all those Mark Twain stories I remember reading when I was a kid. I only wish I could paint to this standard, but at least I can still enjoy this, and all the other bridges here. Best wishes to you Mike. Great article...reminds me of when I used to live in downtown London England back in the late eighties. I loved to walk a cross the Bridges by night and let my Imagination run wild with stories…. 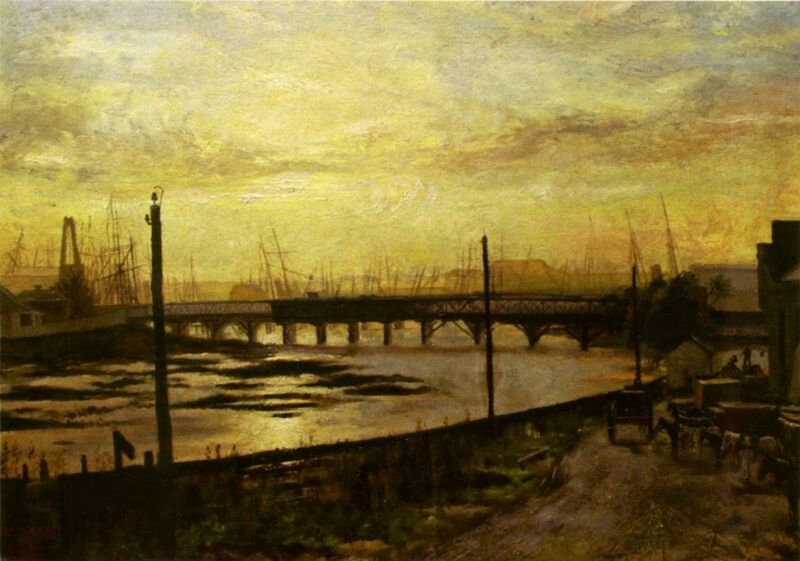 My Favorite bridge from your collection, actually it’s the drawing itself is …”Frederick Oakes Sylvester - The Bridge, 1903” …Boy my imanagition can run wild with the stories that scene could, can be a catalyst for!!!!! Thanks Tony, and I'm with you on the bungee jumping. I'm sure it's a great thrill, but it's not on my list! Bridges are special and have been celebrated for centuries by writers and painters and photogrpahers. Here in South Africa we have some spectacular bridges too, the Storms River bridge and the Gamtoos Bridge. The latter has, I understand, the highest bungee jumpo in the world, from the graceful arch of the bidge into the spectacular canyon below. I'm not about to try it anytime soon, though! Thanks for putting together such interesting stories and pix. Hi Barb, yes, it's been a while, but it's good to catch up with you as always. Nobody mentioned the Bridge to Terabithia yet. I've not read it, although I have seen and enjoyed the film. I chose the bridge theme because it just seems so appropriate for the times we're living in. Perhaps the next hub should be about lighthouses! Now there's a thought.......! Amanda, long time... Did anyone mention the Bridge to Terabithia by Katherine Patterson? What a lovely story that is. Leave it to you to build bridges. I love the theme and your chosen art pieces. What a creative and inspiring soul you are. Hi 2patricias, it's always good to see you here. Some of the artists were new to me too. It's surprising what you can discover when you start researching a hub! Great Hub. As usual you have put together an interesting collection of pictures and narrative. Thanks for taking time to make this interesting article. Some of the artists are completely new to us. We always enjoy your Hubs. Hi bigmikeh, Thank you for the compliments. I'm glad you enjoyed it. What an excellent hub! Well researched and put together to make a very good read. Lovely pictures and photos. Hi askjanbrass, New York is definitely on my list of places to visit one day. Meanwhile I have to make do with the glimpses I find in art and photography. 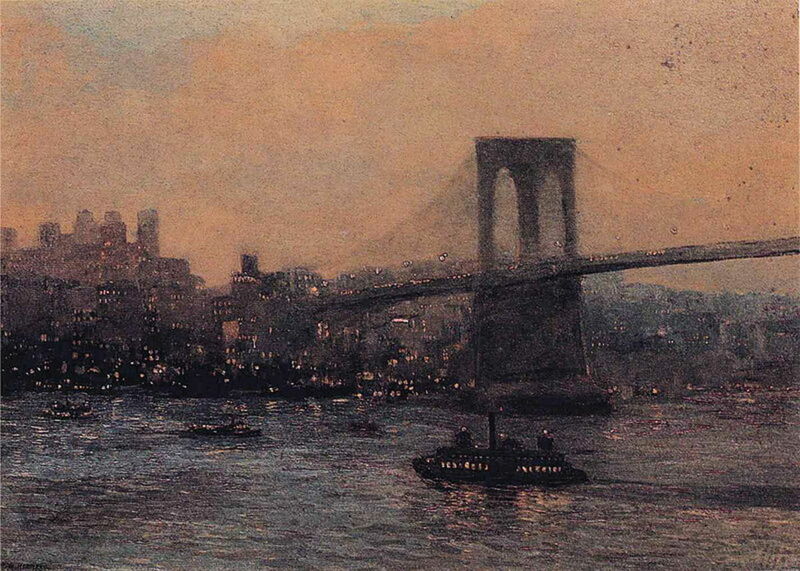 The Brooklyn Bridge at night painting is certainly atmospheric. Thanks for stopping by. The Brooklyn Bridge at night has always been one of my favorite views of NYC. It was quite nice to read about some of these other bridges, and the respective bits of associated artwork and history. Hi Nicks, I particularly like the Repin and the Monets myself. 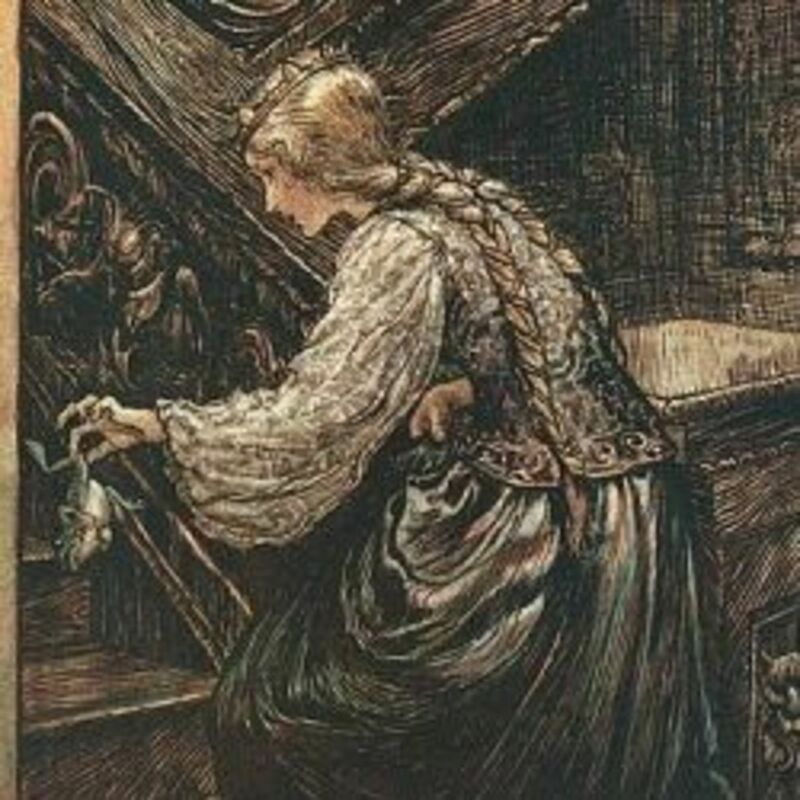 The Repin is really gorgeous, and I was pleased to stumble across it, as I haven't seen many Repins before. Whenever I see great art I always feel inspired to reach for my own brushes! Hi Philipo, your Nigerian bridge is an amazing length. It must be great to cross it often, as you do. HI Avangend, I've never seen the Brooklyn Bridge, but the pictures I've seen of it are impressive. It must be a fine sight. Thanks for stopping by and commenting. Hi Amilar, it's always good to see you here. I'm glad you enjoyed it. 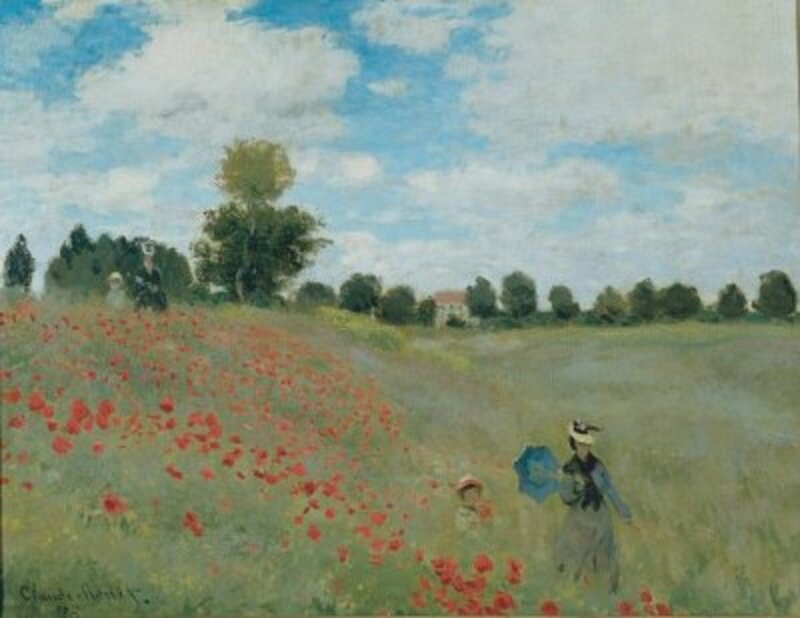 Fabulous - the Repin and Monet are simply terrific! A really gorgeous Hub reminding me how exciting and impassioned great art can be. A great thought which do repeat! Very beautiful hub. I did a hub sometime on the longest bridge in Africa. It is in Lagos Nigeria. Check it out. I have found the Brooklyn bridge to be an especially interesting piece of architecture, especially in its role as a piece of art in the United States. After Roebling built it, it was celebrated as not just a bridge, but something bigger, something symbolic. It was an accomplishment that, more than anything else, evoked a sense of pride (for Americans at least) and led it to become the basis of subjectivity in comparing other non-architectural things. For example: "If we can build Brooklyn Bridge, we can surely cure (insert social problem, disease, government shortcomings, etc). Thanks again for an extremely well written hub. Hi Amanda, nice hub. It's good to see the comparisons - then and now. 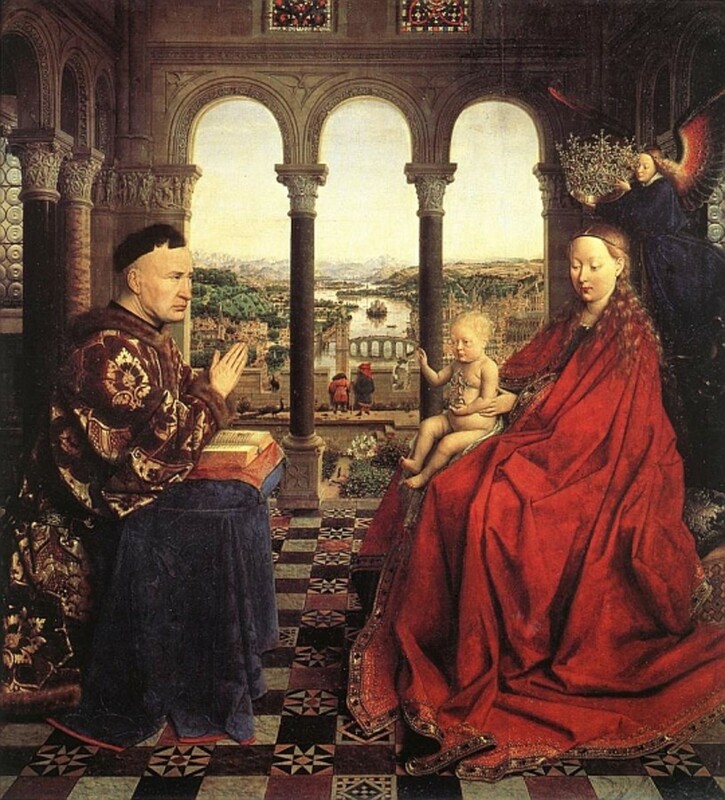 Hi lmmartin, it's always a pleasure putting together art hubs, and I enjoyed this one even more than usual because I had the opportunity to find modern photographs of the original scenes. I like to see how things have changed over time, and it's good to have the comparisons available. I hope your coffee slipped down nicely and that you're having a great day! This was a lovely read to share with my coffee first thing this morning. Thanks for putting this lovely art and explanations together. Hi dimj, thanks for stopping by and commenting. Hi Hello, hello, it's always good to see you here. Thanks for stopping by and commenting. 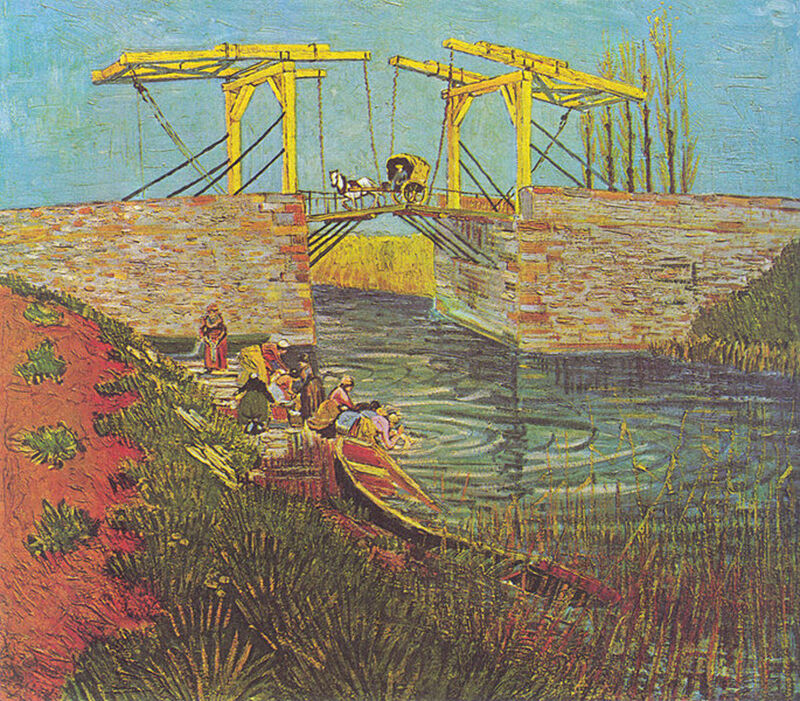 This is a lovely collection of bridges, pictures and paintings. Thank you ery much. I enjoyed it. Hi Bob, I always remember the first time I saw one of Monet's huge water lily paintings in one of the London galleries. I was only a teenager, but I was literally awe-struck. What a fine artist he was. Hi Dolores, thank you for the compliments. I really enjoyed putting this hub together, so I'm glad that you liked it. I love your description of the fog pouring over the hills. Sometimes you get really great views from bridges that you just wouldn't see elsewhere. 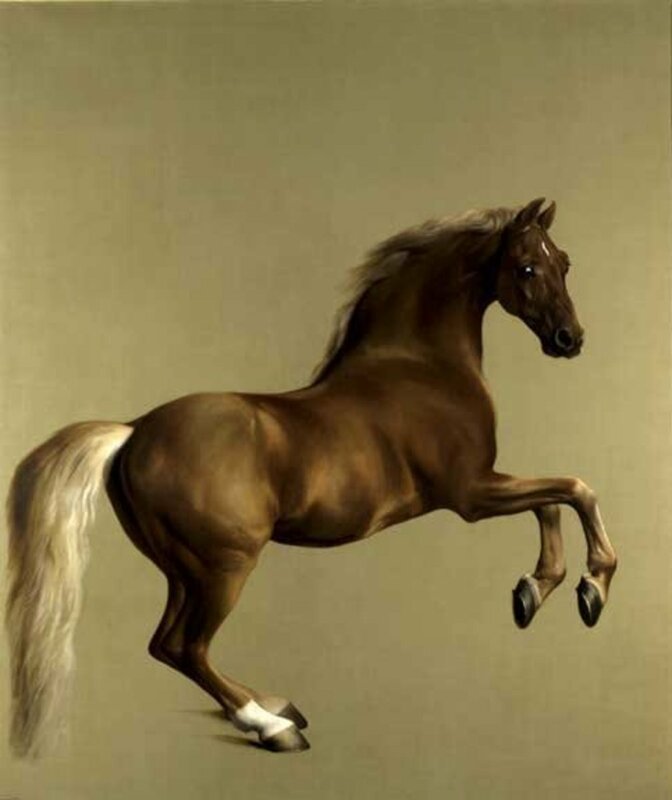 Hi Shalini, I have to agree that the Sylvester painting is particularly striking, but he couldn't have been a very prolific or well-known artist, as unfortunately I have been able to discover very little about him. I like your thoughts about the Simon & Garfunkel song. I might go back and add that later! Amanda, this is one of the most brilliant, beautiful, and comprehensive hubs I've ever seen. The pictures and the copy were fantastic. I'm going back over it again. I loved this! We were crossing a bridge across the Hudson once, I forget which one, and you could see fog in the hills, pouring over the hills like a waterfall. Hi Cris, you're right about windmills and lighthouses. I've painted both myself, and people always seem to like them. I think it's about interacting with the landscape in a positive and timeless way. That was quick BkCreative! I love crossing bridges too, especially those in cities where you get a chance to look up and down the river at the boat traffic, and along the banks at the river-side buildings. I've never been to Brooklyn, but the bridge looks beautiful, and I imagine it's a joy to walk across. I just love stuff like this! Great bridges and great photos and paintings. When I worked in lower Manhattan I walked to work many mornings from my home in Brooklyn - over the Brooklyn Bridge. It was just so liberating. I think it should be a rite of passage that we all cross a bridge at least once in our life (and take some pictures).